LA JOLLA–(June 26, 2018) Salk Institute scientists Ronald Evans, Diana Hargreaves, Tony Hunter, Graham McVicker and Geoffrey Wahl are among the first wave of researchers to receive funding from Padres Pedal the Cause, one of one of the largest stand-alone cancer fundraising events in San Diego. The nonprofit raised $2.4 million for cancer research in November 2017, thanks to the efforts of more than 3,000 bicycle riders, sponsors, volunteers and donors. Pedal the Cause awards millions of dollars each year via its Discovery Grants program to cross-institutional teams of physicians and scientists from San Diego's best cancer institutions, including the Salk Institute for Biological Studies, Moores Cancer Center at UC San Diego Health, Sanford Burnham Prebys Medical Discovery Institute and Rady Children's Hospital. "The Padres Pedal the Cause Discovery Grants are opening the door to critically needed research," say Professors Geoffrey Wahl of Salk and Frank Furnari of UC San Diego, who are leading a 2018 Discovery Grant together. "This funding has allowed us to build a highly collaborative research team to tackle glioblastoma, a particularly aggressive brain cancer." According to Pedal the Cause, the Discovery Grant funding process is highly selective and proposals are screened via a rigorous vetting process. Funding is awarded to best-in-class project submissions to green-light project exploration with the hope that initial findings may lead to additional funding from national sources and, ultimately, a cure. Project 1: "Inducing Cytosolic Chromatin Fragments in Cancer Cells to Turn Cold Tumors Hot"
Project 2: "Understanding and Targeting NRF2 in Pancreatic Cancer"
Project 3: "Targeting a Therapeutic Vulnerability in PTEN-Deficient Brain Tumors"
Project 4: "Natural Killer Cells for Treatment of Medulloblastoma"
Project 5: "Transcriptomic and Epigenomic Profiling to Reveal Tumor-Infiltrating Lymphocyte and Microglia Functional Phenotype and Clonality In Pediatric Brain Tumors"
Project 6: "Responses of Melanoma Patients to Checkpoint Immunotherapy"
Project 7: "Enhanced Breast Cancer Risk Prediction from Imputed Gene Expression"
Project 8: "Epigenetic Profiling of Endometrial Cancer"
Project 9: "Targeting Fibroblast Heterogeneity to Improve Surgical Outcomes in Pancreatic Cancer"
Project 10: "A Novel Role for Histidine Kinase Activity in Neuroblastoma Pathogenesis"
Project 11: "Development and Implementation of a Peer-Navigation Intervention to Improve Research Literacy in Pediatric Cancer Trials"
Padres Pedal the Cause is a 501(c)(3) nonprofit organization dedicated to funding collaborative cancer research in San Diego. 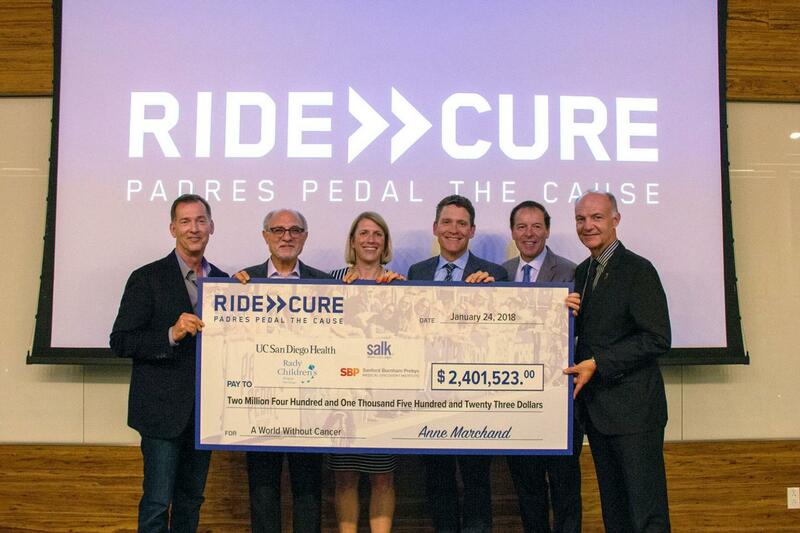 To date, Padres Pedal has raised and donated over $7.1 million to fund 42 translational research projects at Moores Cancer Center at UC San Diego Health, the Salk Institute for Biological Studies, Rady Children's Hospital and Sanford Burnham Prebys Medical Discovery Institute. It is our goal that the research funded by Padres Pedal the Cause will lead to increased survivorship and ultimately, a cure. For more information or to register for the November 17 event, please visit http://www.gopedal.org or on Facebook, Instagram and Twitter.